A day at the spa calls for a special tropical treat, doesn't it? All that getting your hair cut, blown out and then styled, followed by a nail trim and a good tooth brushing works up an appetite. San Diego may well be home to some of the world's top spas, La Costa being one of the most well known (Tiger stays there when he's in town), but Kona and Tavo prefer the Grateful Dog. Coastal in Leucadia, Mary and the other grooming girls take good care of our little guys. They arrive matted, dusty and over-grown and come home soft, styled and smelling pretty. Tavo and Kona post spa! While the pups choice of after spa treat may not concur, the real people in the house fully enjoyed these Blueberry Coconut Macadamia Muffins. With my love of the tropics, either coconut or macadamia alone is enough to turn my head. But, put the two together and we have something to hula about! 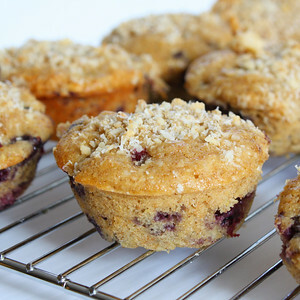 With these muffins Eating Well not only provided one of my favorite combos but they packed it with whole grains and antioxidant-rich blueberries. Tenderized with buttermilk and topped with a lovely mac/coconut/brown sugar streusel these muffins are the ideal post spa snack. (They do well for breakfast, after school or as a late night treat too!). Whisk the remaining 3/4 cup all-purpose flour, whole-wheat flour, coconut, 1 Tbs flax meal, baking powder, baking soda, salt and cinnamon in a medium bowl. Whisk the remaining 1/2 cup brown sugar, the remaining 1 tablespoon oil, egg, egg white, buttermilk, butter and coconut (or vanilla) extract in a medium bowl until well combined. Make a well in the center of the dry ingredients and pour in the wet ingredients; stir until just combined. Add blueberries and the remaining 3 tablespoons nuts; stir just to combine. Divide the batter among the prepared muffin cups. Sprinkle with the reserved coconut topping and gently press into the batter. Tavo (right), wiped out after his big day at the spa, wouldn't even sit for the picture His eyes closed a few minutes after this shot and he enjoyed a nice nap in the toasty sun. Kona, on the other hand, was ready for a run. Your dogs are amazingly cute. I love these pictures!!! Those muffins look wonderful too. I want a spa day too! Especially if I could come back and have some of these muffins with a cup of Ka'u coffee. I actually have some blackberries in the fridge so I might try this recipe with them instead of blueberries. Not to rub it in, but you would love it here today. Not a cloud in the sky and gentle trades have returned, and 86°F. Oh, those pups are tooo cute. Beautiful guys and they look well taken care. Playing with them and having one of those delicious looking muffins would make for a great day- and a trip to the spa! puppies are so sweet! Those muffins look and sound uh-mazing! Great job! The muffins look absolutely delicious and the dogs are precious! Great post. Awww your dogs are so cute. I shall stay on your page for the rest of the day to get a glimpse of them every now and then. They make me smile. The muffins look sumptuous! They are on my "To-make" list now. Your doggies are so cute! And thanks for the good wishes. I'm feeling pretty decent for the day after. The pups are super cute- love them! the muffins look swell. Never tried macadamia and coconut combo. Really mouthwatering! And what a cute hair do!! Wow, I'm not surprised Tavo got propositioned! I wish I looked that good post-spa :D And your husband's response made me laugh! It is still very much winter here but I'm not going to wait until Spring to try these gorgeous muffins. Wow, those doggies of yours are godgeous!! Ooooh those muffins sound fantastic... 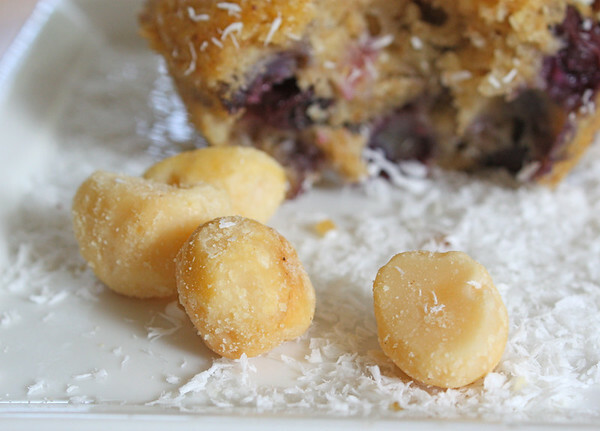 I love coconut in baked goods and adding the macadamia nuts is a brilliant idea! I want to squeeze those two clouds of fluff, and then pick up that wonderful muffin! These look fabulous! YUM! Your pups are adorable! Kona and Tavo are just adorable! But these muffins look so good that I am putting them on the list of things I want to bake with Carla. I'm pretty sure she and her family will love them! Your dogs look so clean and pretty after their spa day! I think my dog may be jealous so I'm not going to tell him about their pampering.I may have to hunt down some macadamia nuts, they're very difficult to get hold of here, but these muffins are so tempting!! My daughter and I are oohing and ahing over Tavo and Kona! What darling pups!! And your muffins look pretty darn good, too! Now that is a muffin that will hit the spot. I love the coconut and macadamia nut combo. The pups are just too cute. Thanks for your visit to my blogs. By you visiting me, it gives me a chance to meet you. The pooches are adorable!!! And that is coming from a total beagle fan. Rarely do I ooh and aah over anything but a beagle puppy. Yours are definitely ooh and aah material. And so are those muffins!!! I LOVE coconut...AND macadamia nuts...AND blueberries. They are a definite must-try. Thanks for sharing!! Hi Kim, Thanks for coming to my blog. Please come back often. I am enjoying yours. Lucky gal--living out there in the CA sunshine.... We are in Tennessee up on the Cumberland Plateau. It's still winter here --although Spring is right around the corner. Love your muffins... They made me hungry!!!!! Thanks for the recipe. Hope you come back to my blog anytime. These cookies look so tempting, as I love macadamia nuts! Plus, your puppies look so cute! Thanks for commenting on my blog. I've added you to my Google Reader and look forward to reading your future posts! Ooo Blueberries, coconuts AND Macadamia? How can you go wrong?! Well, I just stumbled into your site through Meg from Meg in College and you definitely have a new follower in me!! Just found your blog through Souper Sunday and I'm so glad I did. Your photos are beautiful. Oh my stars! Your babies are so darling. 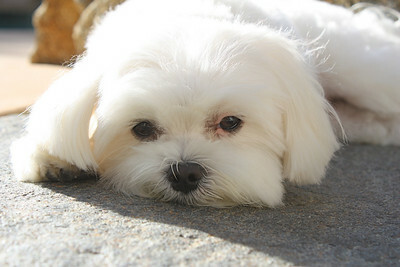 I know one little Maltese living at my house that would sure love to have a play date! Love the story about hubby calling for barber appointment! So cute! Don't want to ignore your recipe, it looks FAN..TASTIC! 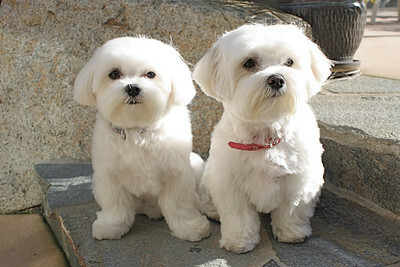 What cute little dogs! They look so nice post spa! 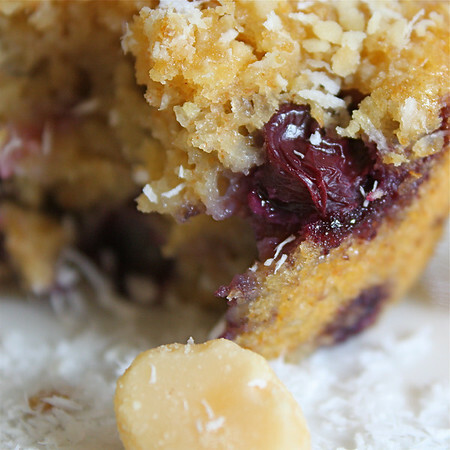 The combination of coconut, macadamia nuts, and blueberries in your muffins sounds fantastic too! 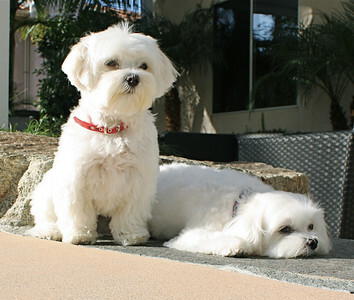 Tavo and Kona are so cute, great pics of them. Bailey is wiped out when she comes home from the "spa". Your muffins a so mouth watering and moist. Such a great pairing of blueberry, macadamia, and coconut. Thanks for sharing! They are the cutest things ever! And the muffins look lovely! The combination is delicious and macadamias are so addicting. They never last long enough in my house to make anything out of them. What a couple of cuties, your groomer does a nice job. And those muffins, wow, I am so making those this week, they look and sound so good, great recipe, thanks. Such sweet puppies! They are so cute...and those muffins?! Kim you are singing my tune today honey...wowza do those look amazing! I could just imagine those coming out of the oven with some butter on each half. So good! Those puppies overshadow your baking! Its hard to say those muffins look great and not include a note about the two fluffy cuties! I feel guilty atm. >.> But those muffins do look super yummy! The puppies are adorable. The muffins looks wonderful. your dogs are super super cute :) and the muffins looks sooo yummy!! Wow, that first photo is incredible! 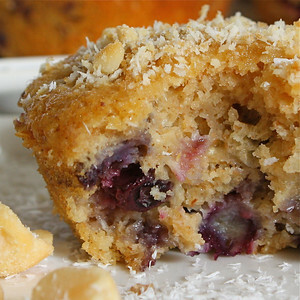 Love your blueberry muffins with a tropical twist. And Tavo and Kona are absolutely adorable! You are killing me with these wonderful blueberry recipes. What a great combo for a muffin. Your pooches look so sweet. There is nothing like a newly groomed dog. Tavo and Kona are absolutely adorable!!!! We were just pet sitting my daughters friend dog named Tofu for a week, I was so sad when she went back home. The muffins look fantastic. Love the addition of macadamia nuts! Your muffins look and sound super delicious! Can't want to make them in my kitchen. Your puppies are so adorable! :) Put a smile on my face seeing their pictures. AMAZING! I love the flavor combo! OMGers, Kim! First off, I'd like your dogs, please :-) Adorableness TIMES a million! Second, I'm adoring these muffins--they have everything that I love, too! You should go to a spa soon--you totally deserve the pampering!